The 236 Source-Measure Unit (SMU) is a fully programmable instrument, capable of sourcing and measuring voltage or current simultaneously. 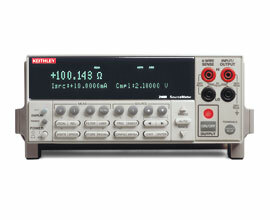 This system is really four instruments in one; voltage source, voltage measure, current source, and current measure. The unit will source voltage from 100 ?V to 110 V and current from 100 fA to 100 mA. It can also measure voltage from 10 ?V to 110 V and current from 10 fA to 100 mA.